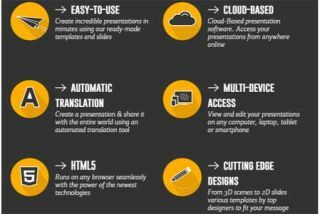 Emaze is a free, online presentation tool that is easy to use and has some beautiful features. You sign in, select one of their amazing templates, create your presentation, and share it. The presentations are created in HTML5 so they are available on any web-enabled device. Presentations can be traditional slides, videos or even 3D. You can create a presentation from scratch, or import a PowerPoint. When you import a PowerPoint file, it will ask you which Emaze theme you want to use and then it will apply that theme to the file. They even have an offline viewer that you can use to be able to view your presentation and show it when you don't have an internet connection. There is also a library of presentations that you can use and modify. The free account is very good and you can upgrade to paid accounts for more features. They also work with school districts and colleges on volume licensing for premium accounts. It's a nice alternative to other products like PowerPoint and Google Slides with some different visual features.